Many felt Taufa’ao Filise was harshly sent off by Nigel Owens on Friday night. The 40-year-old prop was given his marching orders. 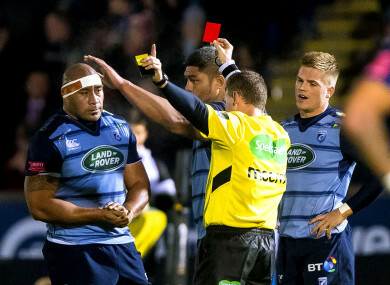 CARDIFF BLUES PROP Taufa’ao Filise will appear in front of a Pro14 disciplinary panel on Wednesday following his controversial red card during the Welsh side’s defeat to Glasgow Warriors on Friday. The Tongan tighthead was sent-off after 29 minutes of Friday’s Pro14 clash at Scotstoun with referee Nigel Owens deeming Filise to have committed an act of foul play in tackling Glasgow’s George Turner. After lengthy deliberations with his TMO, Owens’ initial view that it was nothing more than a collision was upgraded to what he believed was an infringement of Law 10.4 (e) — a player must not tackle an opponent early, late or dangerously. Television replays showed Filise’s hit on Turner was higher than Owens originally thought and the clash of the prop’s shoulder and his opponent’s head led the referee to brandish red. “There’s not enough in the circumstances there to merit anything other than a red card,” Owens said, adding that there was no attempt to make a tackle from Filise and he had to take players’ safety into account. From leading 13-7, Cardiff slipped to a 40-16 defeat as Glasgow — the Conference A pacesetters — maintained their 100% start to the season. Filise will now appear in front of a disciplinary panel via video conference and they will consider if any further punishment is merited. Red card for Taufa'ao Filise! Email “Cardiff prop to face disciplinary panel after controversial red card ”. Feedback on “Cardiff prop to face disciplinary panel after controversial red card ”.